Leeches come in several different sizes: panfish, medium, large and jumbo. Leeches are available from April through October. 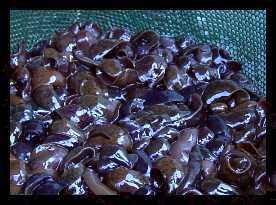 We offer you a choice of pre-packaged leeches in "dozen" containers or bulk leeches by the pound. Leeches are generally quite hardy, and with a little care you can extend their quality even more. For packaged leeches, keep them refigerated at 40 degrees or less (but not below freezing). Change water every other day. Pour leeches into a minnow scoop and rinse with tap water. Bulk leeches should be kept in cold running water or in buckets in refrigeration. Be sure not to crowd them... they like the extra room! Change water daily - don't wait until the water is discolored... at that point they are already damaged.